While planning out your trip to Germany, food is probably one of your top priorities. Where will you eat? What will you eat? The choices are so vast that it can feel like a Herculean task to make a decision. 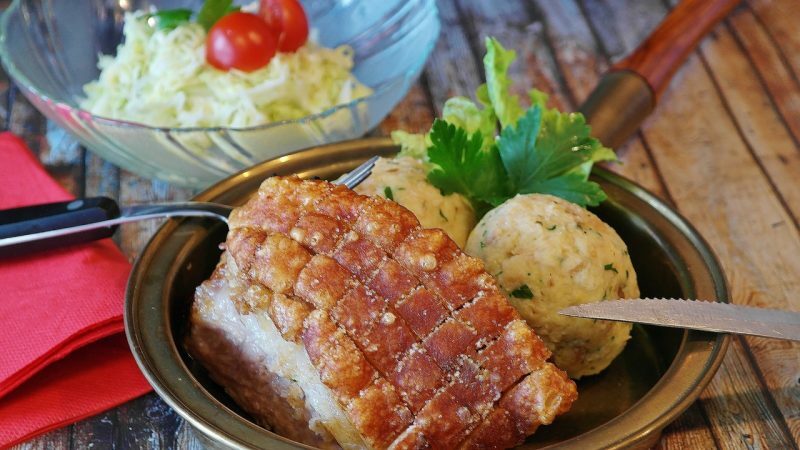 Take a look below to see six of the most delicious German foods that you absolutely don’t want to leave the country without trying! Before you even set off on your tour of all the best foods to eat in Germany, you’re going to want to do a little prep work in advance. Germany is a big country, after all, and even within cities there are multiple specialties, fabulous restaurants, and famous dishes. You can take a look at the interactive map linked here if you want to get a better idea of which area focuses on what type of cooking. That way, you can easily scope out the locations that will cater toward your particular palate and what you’re looking for in German cuisine. 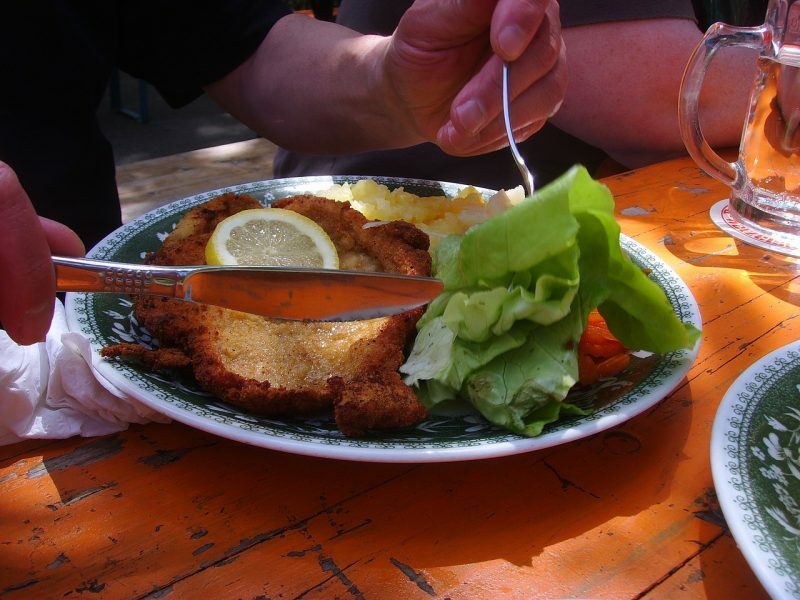 Though this dish is also commonly associated with Austria, schnitzel can be found almost anywhere you go in Germany. This thinly sliced piece of meat is the breaded and fried, giving it a delightfully crispy texture that pairs well with many different sides. If you’re a fan of the more rustic side of authentic German cuisine , this dish is definitely for you. It features slow-roasted pork that has been salted and pickled in order to preserve the meat’s integrity. It’s liberally seasoned with fresh herbs and usually served with side dishes like dumplings or roasted cabbages, making it the perfect hearty meal for anyone who might be traveling in the winter. Wurst is the German word for sausage, and boy do they know how to do it right. From bratwurst to currywurst, the number of Wurst dishes that Germany has to offer is out of this world. There are even entire corners of the Internet dedicated to determining who makes the best currywurst, and you can bet that the competition is fierce. This one is another dish for the meat lovers among us. 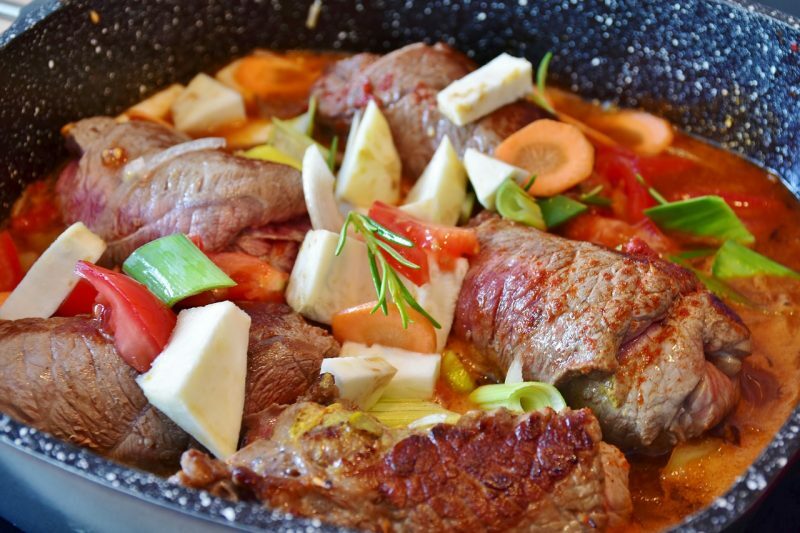 Rouladen features mustard, bacon, pickles and onions all wrapped up in thin slices of veal or beef, which is then cooked slowly together. Beef is usually the most popular, and the dish itself will stick to your ribs all through the rest of the day. 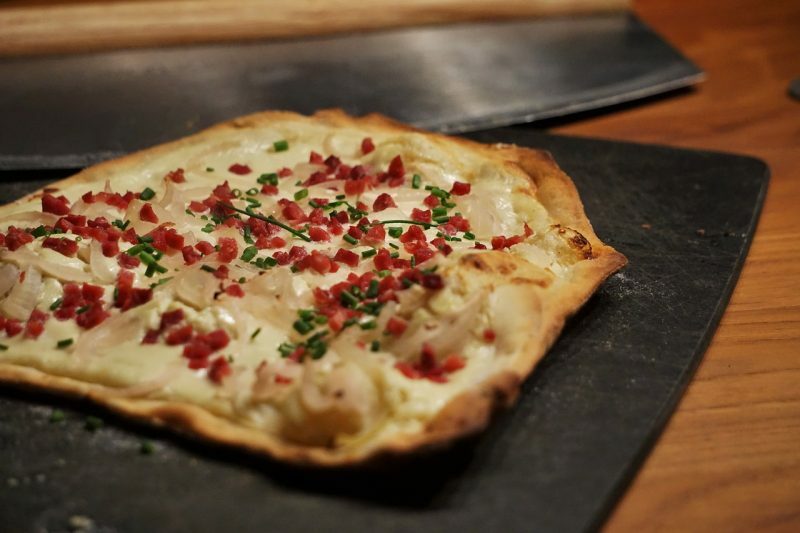 Every country has its own version of pizza, and Flammkuchen is like that for both Germany and France. This dish involves rectangular dough which is then topped with crème fraîche or fromage blanc. Lardons and onions which are sliced very thinly are then liberally sprinkled over the top, and the whole thing is baked in a wood-fire oven to bring out a rich, roasted flavor that compliments the salt nicely. After you’ve set a course across the country, you can even rent a car at a low cost! This can allow you to cram your schedule with even more sightseeing and, most importantly, eating. Get out there and enjoy your German food adventure today! I have tried everything but flammkuchen. My favorite German meal is sauerbraten with red cabbage and potatoe pancake on the side…soooo good. I need to make it soon, it takes a couple of days to make it right. That is very cool! I love German food.